In this article, I want to take it up a notch, which is to say how can you invest when you have more than a few dollars, but not the thousands that traditional investment vehicles usually require? You can also check out my post on the best short term investments for your money! Before I started investing, I was under the same misunderstanding that you had to have thousands of dollars to get started, and my thoughts were how to invest 10K or how to invest 100k? Well now I know more about the world of investing and I can help you out with these same thoughts and fears. For our purposes here we are going to define small amounts of money as something more than $100, but not more than $1,000. Based on that parameter, here are 15 ways to invest small amounts of money. Do you need help finding some extra cash to get started with your investment? Check out these tips on how to make money fast! To be sure, you won’t be able to earn much money on your investments at the bank. However, the advantage that banks offer is that you can invest very little money in a savings account, earn a little bit of interest, and have zero risk of loss. The best purpose for a savings account is to use them as a place to accumulate a larger amount of capital for higher risk/higher reward type investments later on. Some of the investments in this list will require $500 or $1,000 to get started. While that is not a ton of money, if you are getting started with a smaller investment, your best bet might be to take your time to build up a little cash and expand your investment options. There are a number of “robo advisors“, online investment platforms that offer professional management of your portfolio with very low fees. One of the best for small investors is Betterment. You start by completing an online questionnaire that enables the site to determine what your risk tolerance is. Based on that evaluation, a portfolio is created for you with an allocation that includes several different exchange-traded funds (ETF). Because of this allocation, your only responsibility is to fund your account – there is no need to concern yourself with investment selection, or with re-balancing your investments. 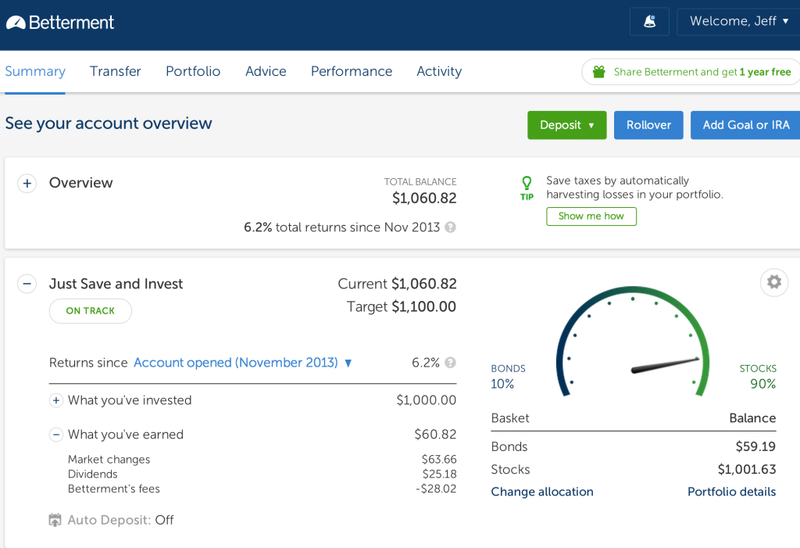 Betterment investments actually has no minimum initial account deposit requirement. You can open up an account by committing to monthly contributions of as little as $100. The annual management fee to maintain your account is 0.35% of your account balance, on accounts of less than $10,000. The management fee works on a sliding scale, and drops as your account balance grows. Lending Club is an online peer-to-peer (P2P) lending platform in which borrowers come to get loans, while investors – a.k.a., lenders – provide the cash for those loans. In exchange, investors are rewarded handsomely for their investment. Rates of return in double digits are hardly unknown with Lending Club. You can invest as little as $25 in a single loan (or note), which means that with the $1,000 minimum initial investment, you can spread your portfolio among 40 different notes. The limitation with Lending Club is that many states have minimum net worth requirements in order for you to invest on the platform. So while the actual amount that you can invest is small, you might still need to show a significant asset base in order to participate. If you are interested in more details on investing with Lending Club check out my Lending Club review. M1 Finance has brought a great new perspective to investing. Like Betterment they allow you to automatically invest in various verticals, but the brokerage also allows you to trade both stocks and ETFs for free. That’s right FREE! M1 Finance, by far, has the largest list of no fee investments available through any brokerage. M1Finance also lets you purchase fractional shares. This means that if Apple stock is currently $400 a share, you can purchase $50 of Apple stock and own 12.5% of a share. Finally, you can get a free financial analysis from M1 Finance, before you invest a single dollar. Fundrise makes investing in real estate a breeze. This real estate investment trust allows you to invest in real estate without flipping houses or becoming a landlord. Fundrise is simple: your money is invested in real estate developments. Whenever they make money, you make money. Just how much money, you might ask? Your returns will vary based on the project you invest in, but Fundrise investors garnered an average return over 11% last year, thanks to technology that pinpoints profitable real estate projects for you to invest in based on your goals. Perhaps the best part of Fundrise is its low minimum. If you’ve ever tried your hand at real estate investing, you know that it isn’t cheap. But Fundrise opens the door for investors who might not have thousands of dollars at their disposal. You can invest in Fundrise with as little as $500. While Fundrise will invest in ideal projects for you, you can also take a more hands-on approach by selecting from a number of Fundrise’s projects to invest in. There are two reasons for leading off with the suggestion to pay off debt. The first is that you shouldn’t be investing small amounts of money if you have debt, especially unsecured debt or have money to save for emergencies. The second is that paying off debt is one of the very best ways to lock in an above average and guaranteed rate of return on your money. This is especially true if the interest charge on a credit card balance is in double digits – there are no places available to the average investor to get double-digit returns that are guaranteed. Let’s say that you have a credit card with a balance of $1,000 with an interest rate of 15.99% per year. By paying that card off, you’ll lock in a nearly 16% rate of return on your money, virtually forever! You can make that card go away faster by surfing the balance to one of the many credit cards with 0 interest. This way each payment goes directly to the balance on the card and not to interest (these offers only last a limited time so pay them off fast!). This is probably the easiest way to invest small amounts of money, or even if you don’t have any money at all. That’s because it’s generally set up as a payroll deduction so that you can allocate a percentage of your paycheck to go to the retirement plan. You can designate just about any amount of your paycheck that you choose – as low as 1% to 20% or more, depending on the rules established by the employer plan. In this way, you don’t even need to have a large nest egg to invest. You can just add small amounts to your account with each paycheck, and then begin investing in any types of investments that your available capital (and the employer plan) will permit. Best of all is the tax benefits! Not only are your contributions tax-deductible, but the income earned on your investments will not be subject to income tax until you retire begin withdrawing money. In addition, if your employer offers a matching contribution, it will be like you get free money just for saving a little. No matter how much money you have to invest, investing in your employer-sponsored retirement plan should be one of the first steps you take. If you don’t have an employer-sponsored retirement plan, you can almost always set up your own retirement plan. All you need to qualify is earned income. The two best plans for most people are either a traditional IRA or a Roth IRA. Much like an employer-sponsored retirement plan, any returns on investment that you earn are tax-deferred until you begin withdrawing the funds in retirement. Also, contributions to a traditional IRA are generally fully tax-deductible. Roth IRA contributions are not tax-deductible, however, withdrawals will be free from taxes as long as you are at least 59 ½ at the time the withdrawals are made, and you have participated in the plan for at least five years. And though there is no employer matching contribution (since there is no employer), a self-directed traditional or Roth IRA can be held in a brokerage account that offers nearly unlimited investment alternatives. You can contribute up to $5,500 per year to either a traditional or Roth IRA ($6,500 if you are age 50 or older), which means you can build up a substantial portfolio in just a few years. Also with the best Roth IRA providers, there is a very low entry cost. Prosper works much the same as Lending Club. You can invest as little as $25, so you can spread a few hundred dollars across many different loans. There is also a state-by-state minimum net worth requirement here as well. Prosper reports that the average annual return on a note approaches 16%, which is an incredible return on a fixed rate investment. In the case of both Prosper and Lending Club, there is a risk of loss to your principal in the event that one or more loans you’re holding goes into default. There is no FDIC insurance protecting your investment the way it would with bank investments. I also did Prosper reviews for both borrowers and lenders. You can get full details of the platform there. If you are looking for a more conservative investment, one where your principal is protected from market swings, you can invest in US Treasury Securities. These are debt obligations issued by the United States Treasury Department, to fund the national debt. Securities have maturities ranging from 30 days to 30 years (longer term maturities do involve a risk of principal if you sell before maturity). You can invest in these securities through the US Treasury’s Department’s portal Treasury Direct. By using the portal, you’ll be able to buy US government securities in denominations as low as $100. You can sell your securities there as well, and there are no early withdrawal penalties for doing so. You can also use Treasury Direct to buy Treasury Inflation Protected Securities (TIPS) too. These not only pay interest, but they also make periodic principal adjustments to account for inflation based on changes in the Consumer Price Index. Are there any skills that you could acquire that could bring you up to the next level in your career? Think in terms of learning a new computer application, a foreign language, or taking a public speaking- or sales-course. It’s possible that you could acquire certain career-enhancing skills that would enable you to either get a promotion on your current job or even transfer to a new, higher paying position with another employer. A few hundred dollars is often all it takes to take a course to learn that kind of skill. Better known as DRIPS, these are plans that allow you to invest small amounts of money into stocks of companies that pay dividends. Many large companies offer DRIPS, so if you want to invest directly in stocks, and you like certain companies, you can invest in those companies – usually without having to pay any kind of investment fees. DRIPS typically allow you to build your investment over time by making periodic contributions. Often, this can be done using payroll deductions. This can also be an excellent way to dollar cost average your way into large investments in major companies. And when you earn dividends, the money will automatically be reinvested to buy more company stock. Different mutual funds and ETF’s have different initial investment minimums. Many do require that you have several thousand dollars to open an account, but there are some that allow you to start an account with far less. An example is the Schwab Total Stock Market Index (SWTSX). With a required minimum that is that low, you could spread $1,000 across 10 different funds. You can check with any large mutual fund families, and even some investment brokerage firms, to see which funds are available with a minimum initial deposit of $1,000 or less. You may find index funds to be your best bet since they represent the best play on the entire market. It can come as surprise to many small investors that you can actually open up an account with an online brokerage firm with $1,000 or less. For example, the minimum initial deposit to open an account with Charles Schwab is $1,000 but even that can be waived if you set up an automatic monthly transfer of $100 through direct deposit or Schwab MoneyLink or open a Schwab Bank High Yield Investor Checking account linked to your brokerage account. In addition, you can open a brokerage account with E*trade with as little as $500. And TD Ameritrade has no minimum initial deposit to open a new account. The advantage of investing through a brokerage firm is that will provide you with a wider variety of investment choices than you can generally get through direct investments alone. Check out some of our great investment brokerage reviews for your reference: E*Trade Review and TD Ameritrade Review. I’ve discussed investing in other businesses so far, but if you’re looking to invest small amounts of money, investing in your own business could prove to be the best choice of all. After all, who better to invest in than yourself? For example, for a few hundred dollars you can buy a decent lawnmower, and start cutting lawns to generate income. With that few hundred dollar investment, you could have more than five thousand dollars to invest in no time. You could also start a website, dedicated to selling a certain product line. Or you can start a blog and use it to create affiliate sales arrangements. If it’s something you might enjoy doing, you could go to garage sales, estate sales, flea markets, and thrift stores, and by unusual goods and sell them at a profit on eBay or Craigslist. With advances in technology and the growth of the Internet, it’s easier than ever to start your own home based business on a shoestring. If you only have a few hundred dollars to invest, investing in starting your own business could be the most profitable venture of all. Many business owners start out by picking up a part-time job or side hustle to make extra cash to get their business up and going. A great side hustle is to become an Uber driver, you can create your own schedule and just sit back and drive and earn extra cash to throw at that dream of yours! So here you have 15 ways to invest small amounts of money, so there’s nothing stopping you from investing in something. Investing is one of those activities where the most important step is getting started, and here are the ways you can do it. I love this article, it has open me to some new insights. I will like to know more about bank investment, I.e, the best investment one should engaged in in banks because most at times the interest rage of banks are very low. Hi Royalson – Local banks pay very little in interest. But you’ll get better returns at online banks. As far as selling goods, look for unusual items. Steve Chou and his wife turned selling wedding linens into a six figure business. What is the 15th one ? Hi Aditya – It’s starting your own business. Instead of investing in someone else’s business, like buying stock in a company, you instead invest the money in your own business venture. Today, with the internet, it’s possible to start a lot of different businesses on just a few thousand dollars. Please I need help in investing my money…..
pls how do I go about it ?? Hi Dave – It’s all in the article, just give it another read. which is the best site i can invest on with a little amount of money like #1,000?.. Hi Philip – Since I don’t know you, I can’t advise you personally. I’d suggest that you carefully review all 15 in the article and decide which will work best for you. These are all good ideas. The one I would add a caveat to is “You shouldn’t be investing small amounts of money if you have debt.” I think it all depends on the interest rate. If you are earning 6% from investments and have a mortgage with 3% interest rate, your money is working harder for you in the savings account than it would be if you paid down the debt. I love the advice to pay yourself first. Even if you start really small, put that aside before anything else. People are often less hard up than they realise when they follow that strategy. Hi Neil – I should have clarified I was talking about consumer debt. That’s usually high interest debt. The rate will almost always be higher than what you can get on your investments. That definitely needs to be paid first. Hi Jeff, I’ve been watching your videos, perusing your web sights and I love what you share, your creative ideas, and your presentation. So… I watch people (like you) find ways to make more and more money. Pretty soon you need an office, and then employees. You go from one or two ventures to manage, and then 3, then 5 then a dozen! I’m wondering – how much of the money you make, goes back into paying for the office, employees, and other expenses? And that’s awesome if for every new dollar of expense, you are making $3 or $50 or $1000 more in profit! My quest: I would like to find a “sweet spot” where I am making a wonderful amount of income, with the simplest management needs possible. Just me – no employees to manage. No brick and mortar to furnish and pay for. Not be tied to a multiplicity of sites, forms, entities that consume huge amts of time to monitor, post on, etc. It’s a trade-off: less stress for less income. I’m OK with that. But I’d like to find that spot where the maximum income is and still be in that low-stress management spot. Looking for those options that are probably more work initially, but then become more self-sustaining and residual. Can you offer any insights to which opportunities would best fall into that category? Thanks so much! Hi Susan – You’re looking to make as much as you can as a solo entrepreneur. I get it, you don’t want the overhead costs of employees, office space, insurance, benefits, etc. The best way to do that is to maximize your own ability to monetize your skills. That is, get to the point where you’re making maximum revenue on your work. But you can also leverage applications and systems. For example, if you run a website, you can add an app that builds your mailing list, and even sends out regular updates. If you do need people help, you can hire outside contractors, or even partner with other businesses. All will enable you to expand your income without adding overhead. But exactly what you do will depend on how you’ll be making money. I hope this answers your question. Hi Bijoy – You should try to see if there are any robo-advisors available in your country. They can diversify you account between stocks and bonds, allowing you to have some growth in your portfolio. They can do this even with small amounts of money. This list is quite incomplete without mentioning the Robinhood App, which literally charges you nothing for trading stock. Forget DRIPS, you can buy whatever stock or ETF you want (dividend paying or not) on the app for free. Another platform that will allow you to invest small amounts of money (as little as $20.00 per transaction is kickfurther.com (http://kickfurther.com/s/bvy454dcnd is an affilliate link and if you use it, you get a $5.00 credit) Kickfurther crowdfunds inventory for small businesses. They buy the inventory as agent for the investors and then the businesses sell it on consignment. Returns seem to be about 1.5% per month, without taking defaults into consideration. The platform is new and the downside is unknown at this time, but I made 8% on one deal in just three months. I’m using Kickfurther as well. It’s come along way since your post (Aug 15). As a college student, I don’t have too much extra cash to throw around but I’ve earned just over $1K so far with more paybacks to come. I’ve worked with brands that payback super early and earned 12% in 3 months because of that. Great list! There are so many options to get someone started. That can be a good thing…and a bad thing as it becomes overwhelming and scary. I generally advise 2 options: 1) get out of debt and 2) Indexed ETF’s. Above and beyond that is icing on the cake (if we dont neglect 1 and 2). If you only have a little money to invest some of these suggestions are really bad. Betterment for instance charges $3.00 per month if you are not auto investing at least $100/month. So you have to put away $100 each month in order to qualify for the .35% rate. That is really not clear in the article. Some of the other suggestions are okay but not really going to turn a little money into a lot. Since many people reading this article are probably very unsophisticated investors, I think this is a poorly structured piece. @ Bob So paying $3 per month to have a professional money manager select low cost ETF’s on your behalf and monitor those ongoing is a bad thing? Yes its absolutely a bad thing. If you have not personally interviewed the person/company that is handling your money, you sir are putting yourself in a bad situation. Would you hand your money over to someone you don’t know and just pray they know what they are doing? @ Drew people do it in their 401k’s all the time. Ok so do you think would be a good way to start investing? I have some capital and very little debt. I am just very confused on what to invest in that will help me grown and move on to other ventures.